ToyWatch celebrates Valentine's Day by giving a box of GODIVA Limited Edition Valentine's Day Gift Box (Worth $39) with every $400 spent! ToyWatch, created in 2006, is an Italian designer horology house that specializes in timepieces that take inspiration from its luxe cousins. ToyWatch is unexpected, arresting, irreverent and a tongue-in-cheek anti-luxury statement in a culture driven by luxury. Catering to a clientele with a taste for fashion and appetite for the cult, ToyWatch is also highly coveted by celebrities the likes of Oprah Winfrey, Sylvester Stallone, Michael Jordan, Leonardo DiCaprio, Madonna, Al Gore, Charlize Theron. 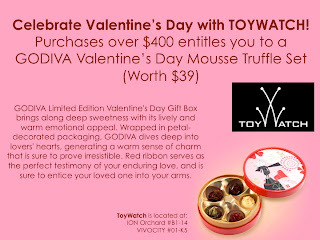 TOYWATCH has become the “it” timepiece and a “must-have” among style influentials and tastemakers. The timepieces have also been featured on Oprah's 'Favorite Things' list, and The Ellen DeGeneres show.